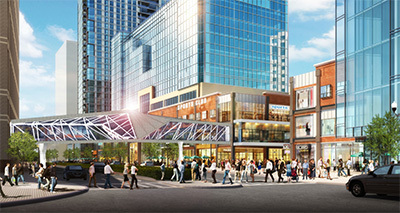 Ballston Quarter is a unique urban project that transformed an enclosed retail mall into a vibrant mixed-use destination. Join us for a tour of this new development co-hosted by AIA Northern Virginia’s Young Architects Forum (YAF) and Women in Architecture (WIA) committees. By turning the existing mall “inside out” this recently-completed project has enhanced the fast evolving Ballston neighborhood in Arlington, Virginia. The design of the project partially removed the mall’s roof to create an open-air, multi-level network of spaces that blends indoor with outdoor environments and connects the development with the surrounding streetscape. Tour attendees will have the opportunity to mingle with fellow architects and design industry professionals, explore the Quarter Market (Arlington’s first food hall), and to hear first-hand how thoughtful design can create a sense of community. Presenters: Lauren Perry Ford, AIA, LEED® AP, Associate Principal, and Patrick Finucan, with Cooper Carry. 1 LU|HSW $10. Happy hour to follow at Punch Bowl Social. • Participants will examine how the project’s design responded to the development’s goals, including the integration of existing building facades, to create multiple buildings rather than a single large structure. • Participants will assess the key factors in facilitating the conversion of a formerly enclosed structure into a development that mixes indoor and outdoor space, including the alignment of complex drainage systems, waterproofing, thermal insulation, and special finishes. • Participants will consider the alignment of design with code requirements in order to balance energy efficiency with comfort. • Participants will identify the strategies to incorporate legal public easements and protected and accessible connections that ensure round-the-clock public access to the parking garage and skating rink, mall, and public transit.